A. L. Merrill was a Toronto-based publishing and wholesale stationery business founded by Clarence R. Parish and managed during the “postcard era” by Arthur Lawrence Merrill (1864-c. 1949). The business was originally known as C. R. Parish & Co., a company that appears to have been local in origin but which had branches in Philadelphia, Columbus and upstate New York (Port Byron). After about 1902, “A. L. Merrill” seems to have been the most common name for the company, but the “C. R. Parish” name was also used from time to time. From the 1880s, the company’s business was usually described as “publishers of subscription books”, but after Arthur Merrill took over as manager, it seems to have expanded into souvenir goods, most notably stereo view cards, but also (in quite a significant way) postcards. Around 1902, Merrill relocated the business from 28 Toronto Street to 304 Yonge Street. In 1906, he expanded to a second location at 125 Queen Street West. Before long, the business had three downtown locations. In 1906, the company was advertising postcards under the Parish name, as indicated in Figure 1. That Arthur Merrill was an ambitious businessman is suggested by the fact that his company advertised regularly in major publications like Bookseller & Stationer and in newspapers in Toronto, Winnipeg and Vancouver (and probably elsewhere as well), seeking agents. A typical advertisement in the Manitoba Free Press read: AGENTS – STUDENTS – TEACHERS – Here’s your opportunity. Five dollars a day easily made selling stereoscopic views. A. L. Merrill, Toronto. Figure 1. C. R. Parish & Co. advertisement published in Bookseller & Stationer, March 1906. Figure 2. 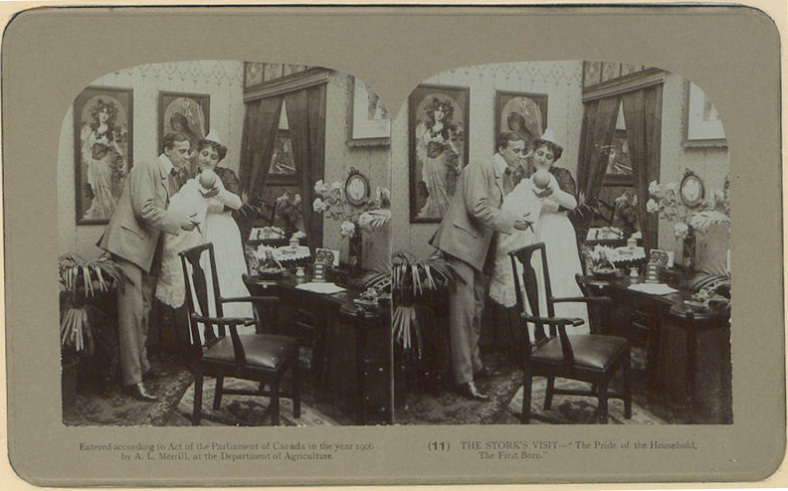 The Stork’s Visit (stereo view). From the British Library Colonial Copyright Collection, deposited 1906 by Arthur L. Merrill. Students at Merrill’s alma mater, the University of Toronto, were solicited as potential stereo view sellers in advertisements that regularly appeared in The Varsity, the student newspaper. In 1908, during a police crackdown on postcard obscenity, A. L. Merrill was one of several Toronto postcard retailers who were charged with selling lewd cards. Merrill escaped a stiff fine and possible imprisonment by shifting the blame to a clerk who, he said, had brought the offending material into the shop of his own accord and was selling it for his own profit. This event does not appear to have damaged the A. L. Merrill business, which appears to have thrived until around 1910. In those years, it seems to have been one of Toronto’s leading purveyors of stereo view images (see Figure 2) and, from its location at 62 King Street West, was also a major importer, wholesaler and retailer of postcards. However, paralleling the rise and fall of many others in the industry, Arthur L. Merrill’s ambitious enterprise did not survive into the second decade of the century. By 1911, it was no longer to be found in the city directory. That same year, Arthur Merrill joined the Souvenir Post Card Co. as manager. Souvenir Post Card Co. images of Toronto exist from about 1907, but those earlier postcards give “New York and Berlin” as the company’s locations. Perhaps Arthur Merrill was assisting in an attempt to establish a Toronto branch of the company. 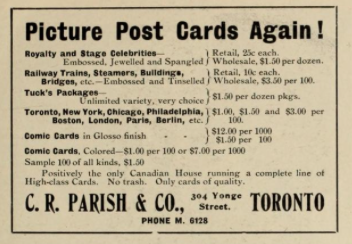 In any event, this final postcard-related endeavour lasted for only a year or two (Souvenir Postcard Co.’s Toronto office appears to have closed in 1912) and by 1913 Arthur Merrill was no longer listed in the Toronto directory at all. His later life in Saskatchewan is discussed further in the “biography” section, below. While there are examples from a number of Canadian provinces, A. L. Merrill’s view cards seem to be predominantly from Toronto and southern Ontario. 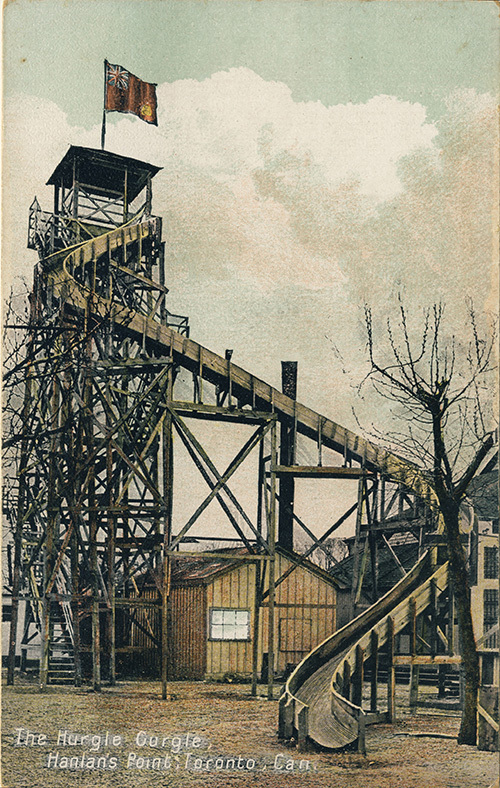 However, as Figure 1 indicates, the bulk of the company’s postcard business involved the distribution of many lines of fancy postcards imported from Europe that are unlikely to have had A. L. Merrill’s name on them and which would thus be difficult for today’s collectors to identify as “Merrill” products. A nice example of a local card is Figure 3, showing the “Hurgle Gurgle” ride at Hanlan’s Point on Toronto Island. 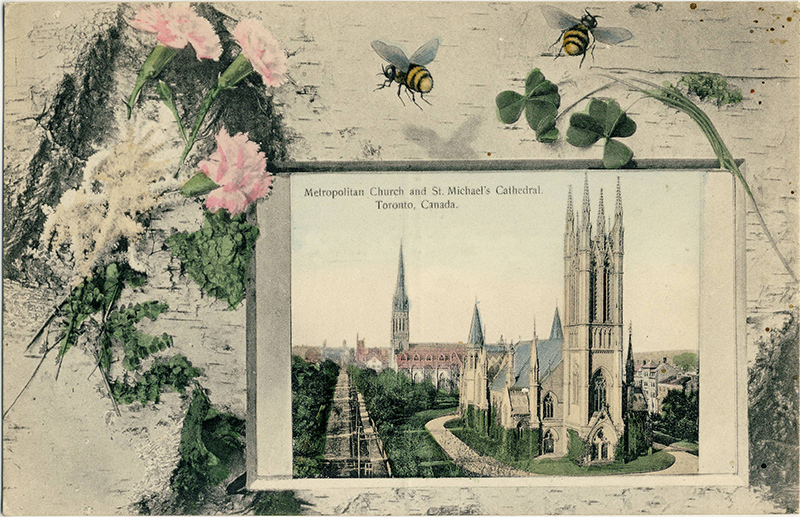 One of the better-known A. L. Merrill postcard designs is the elegant series of “flower and insect” cards, illustrated by Figure 5, which show scenes in Toronto within a handsomely illustrated framing image of (in this case) bees and carnations. The high quality of the artwork on this series of postcards suggests that it was produced in Germany. Arthur L. Merrill was born in Brant County, Ontario, apparently on 7 April 1864 (although the 1901 census gives “1863” as the year). On 22 April 1886, he married Katie Trainor at Glanford, Wentworth County, shortly after he had received his teaching certificate from the Ottawa Normal School. Merrill graduated from the University of Toronto (University College) in 1891 and, at the time of the 1891 census, was a public school teacher in that city. In 1895, an Arthur L. Merrill (presumably the same man) was teaching at the Collegiate in Ottawa. By 1901, Merrill was not only a book publisher in Toronto (according to the census) but the author, in collaboration with the Rev. 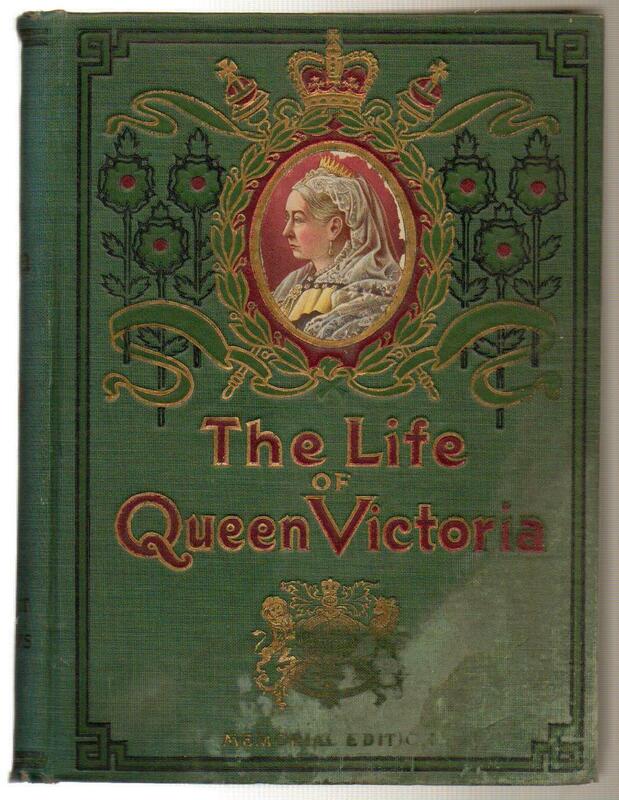 Henry Davenport Northrup (1836-1909), of a Life of Queen Victoria that was published on the Queen’s demise in 1901 by Bell Publishing of Philadelphia and Parish Publishing of Toronto (in some cases in a “Memorial Edition” — see Figure 4 — that appears to have been credited only to Lawrence). After his decade in the publishing business, Merrill left Ontario, settling in about 1912 at Kerrobert, Saskatchewan with his wife and daughter Olive. There he resumed his career in education as a school principal. As to salaries only a few were amply compensated. The average salary was less than that of a billiard maker or of a barber. A teacher, whose education has entailed considerable expense, should receive as much compensation as a good mechanic at least. Merrill and his wife (together with Olive) were living in the Balfour Apartments, Regina, Sask., as late as 1949, but his exact date and place of death have not yet been discovered. Error: Error validating access token: Session has expired on Friday, 12-Apr-19 20:21:58 PDT. The current time is Friday, 19-Apr-19 21:56:12 PDT.